"This season I've been preoccupied by the relationship between geometry and art. These two visual mediums are both articulated through pattern, form and colour - things that have always fascinated me. Starting with the 'simple' circle - perhaps the most intriguing geometric shape - I've mixed native craft techniques and cutting edge technology to create complex shapes. I like to think of this as the leather work equivalent of a mathematical equation." A large white circular stage filling the centre of the show space, but once the lights dimed and the music started, this circular stage lifted into the air, to reveal a swirl of stairs and from it emerged the first of the models. First lets discuss the beautiful collection of clothing pieces - made from a stiffer neoprene fabric, simple shapes with intricate detailing through cut outs and embellishments. The basis of the embellishment is the simple circle, combined into these intricate leather decorations adorning the shoulders, pockets and hemlines - simple but beautiful. 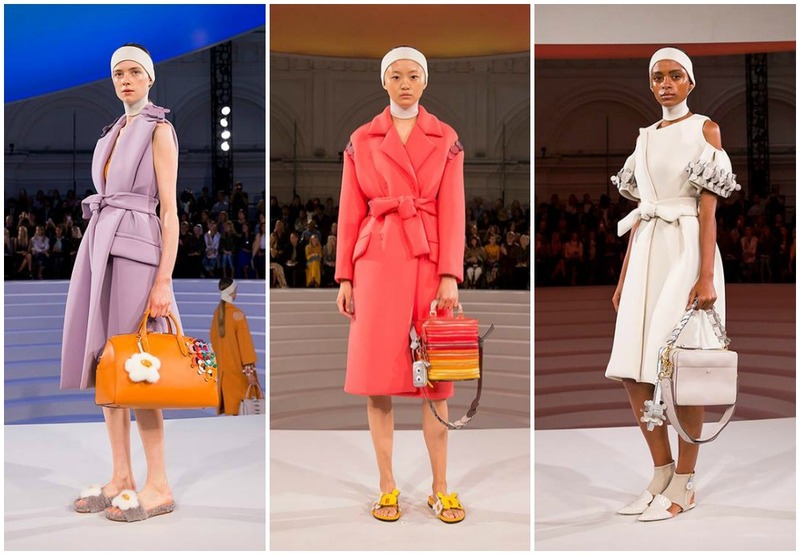 Long line coats and sleeveless jackets covering pastel colourblocked swimsuits - all very ladylike, feminine and almost vintage, in pastel shades balancing out the tougher structure of the fabrics. The collection colour palette was based around pastel/sorbet shades of coral, yellow, lilac, pistachio and off white with brighter bold pops of mustard, lime green and intense orange. 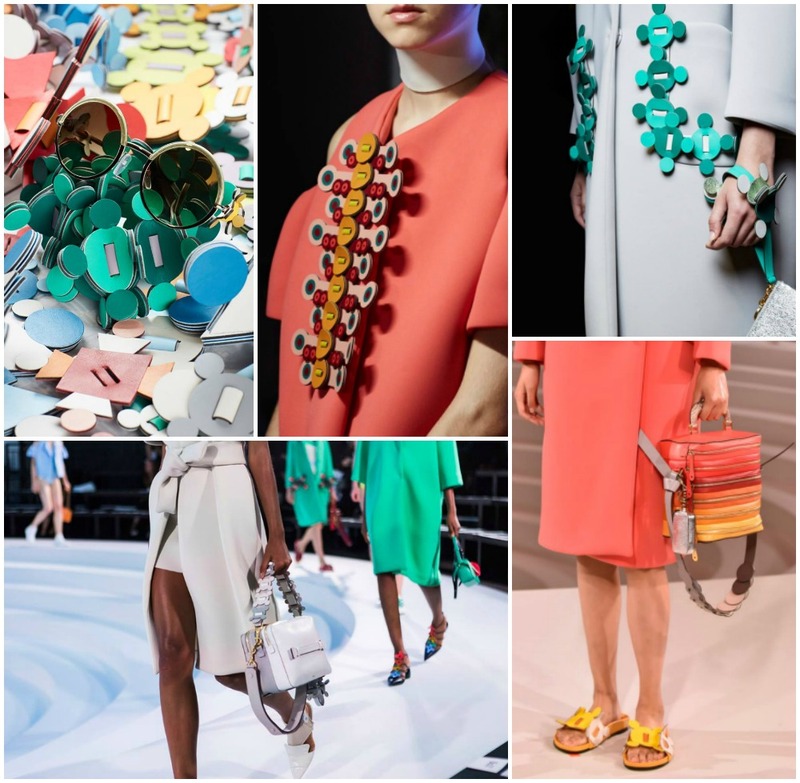 A delightful new take on the traditional spring summer colours typically seen - this mixed with the unusual textured neoprene offered something new and exciting. Of the 40 looks in the show, these were my favourites - three amazing style coats. A simple longer length cut with a belt to cinch in the waist, bold solid colour with statement shoulder detailing what isn't to love? 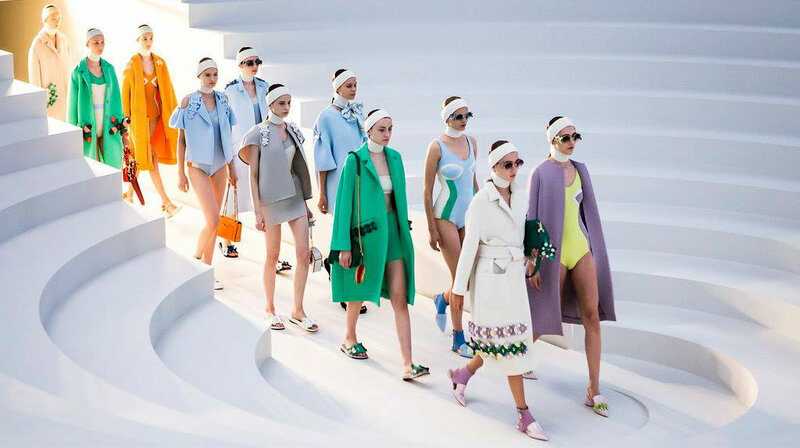 The only part of these looks i am not so mad about are the shoes...i love the quirky touches that are synonymous with the Hindmarch brand but furry fried egg flip flops are just a little too bizarre for me. 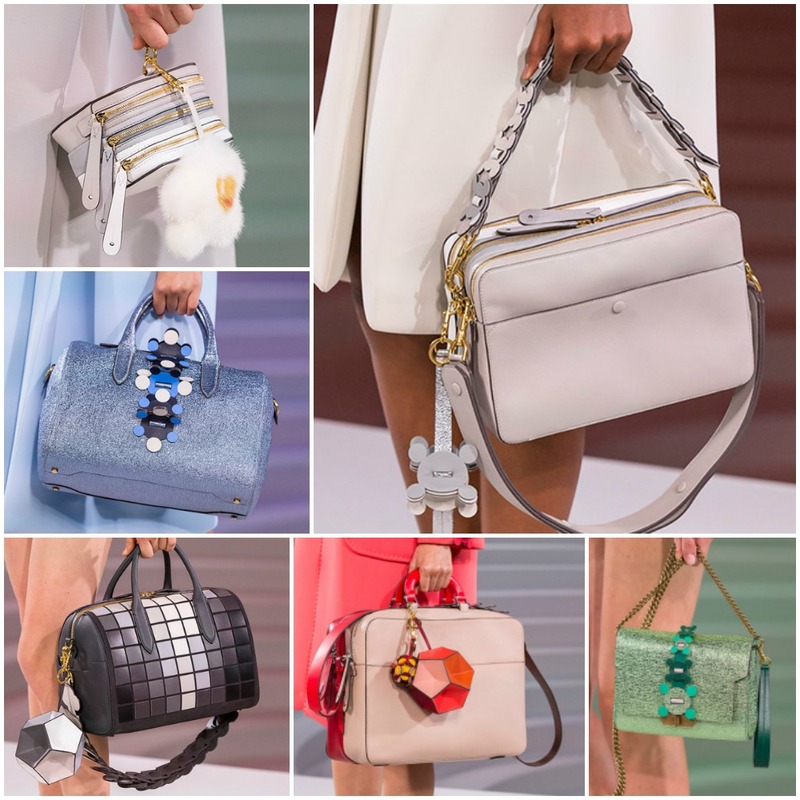 So onto my favourite part of the show, in fact any fashion week show...the bags! If i had to choose only one, to add to my SS17 wishlist, it would have to be the lilac/white box bag (largest image above). I was immediately drawn to the simple shape, intricate woven straps, touch of silver glitter and all those pockets. In a similar style to the clothing, the bags are quite classic, simple silhouettes but all given that added Hindmarch touch through colour, texture and hardware. Supple leathers, touches of metallic, statement zips, mosaic tiles, decoupage style embellishment made up of colourful circles, chunky hardware and ornate woven leather straps. And if that wasn't enough, all manner of fun keyrings - colourful pentagon cubes, googly eyed purses, furry fried eggs and rainbows. This is just a snippet of the collection, the pieces i loved most - for the whole collection and to watch a video of the show (worth it to see the clothing in their full glory) head over to the website - anyahindmarch.com.